The American University in Cairo’s president issued a statement on Tuesday morning, stressing that solutions will be found to address concerns about an increase in tuition fees, a day after students held a strike on campus. 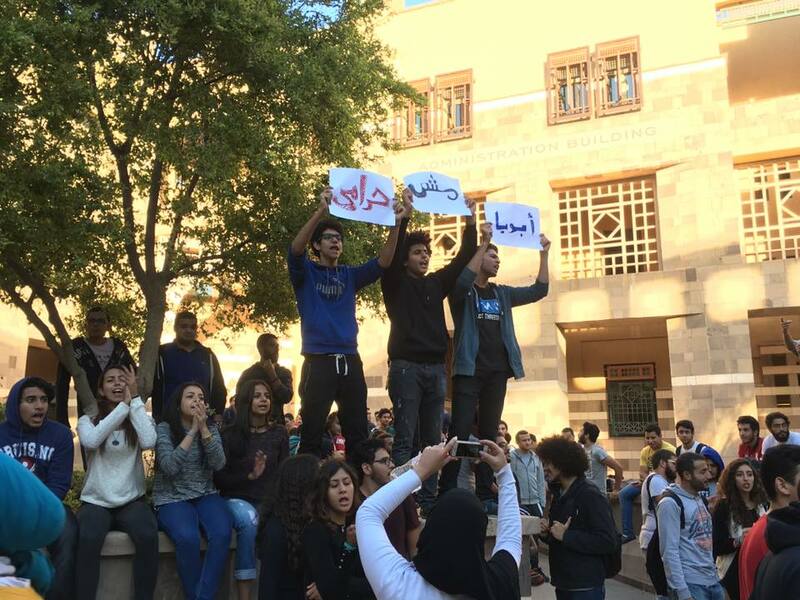 AUC students went on strike after a forum held with the administration on Tuesday to discuss the effects of the flotation of the Egyptian pound on tuition fees failed to address concerns. Egypt’s central bank announced the floating of the pound on Thursday, allowing the exchange rate to be determined by the supply and demand mechanism. The pound’s exchange rate was formerly fixed at 8.8 to the dollar, but under the new system, the pound has approached 18 to the dollar in some banks on Tuesday. President Francis J. Ricciardone said in an email that immediate solutions would be found “so that no current student will have to withdraw” for inability to meet the deadline on November 20 for the third instalment. AUC policy requires students to pay their tuition fees half in dollars and half in Egyptian pounds. Students who have opted for deferred payment still need to pay their third and last instalment for the Fall 2016 semester on November 20, but with the new exchange rate, tuition fees would skyrocket. Another forum will be held on Wednesday with the administration, according to the Student Union. “I found myself hoping I can finish this semester and that the hard work I’d already put into it will pay off, but the realization that it might not was never far from my thoughts,” Sophomore student Nadine Fahmy told Aswat Masriya, adding that the increase is almost EGP 10,000 compared to the initial amount that was due under the previous exchange rate. Students marched on campus, chanting “our parents are not thieves” and calling on students to join the protest and leave their classes in an attempt to pressure the administration to respond to their urgent questions and demands. Student Union president Amr Al-Alfy said on Tuesday that the administration is working on solutions and “re-budgeting,” ahead of a planned forum on Wednesday at the Bassily auditorium to follow up on the issue. Speaking on the ailing economic situation Egypt is currently facing, Ricciardone expressed his confidence that the country and AUC will not just survive but will “do far better” than that, giving credit to the latest national policy decision to float the pound. Businessmen and economists predict that it will take a period of at least several months before benefits of the flotation could be felt, while inflation will continue to rise significantly affecting living standards, according to a Reuters report. Egyptians have come under increasing pressure to make ends meet after decisions to float the pound and cut fuel subsidies among others exacerbated already existing shortages for many households. Ricciardone was officially inaugurated as the AUC’s 12th president on October 17.